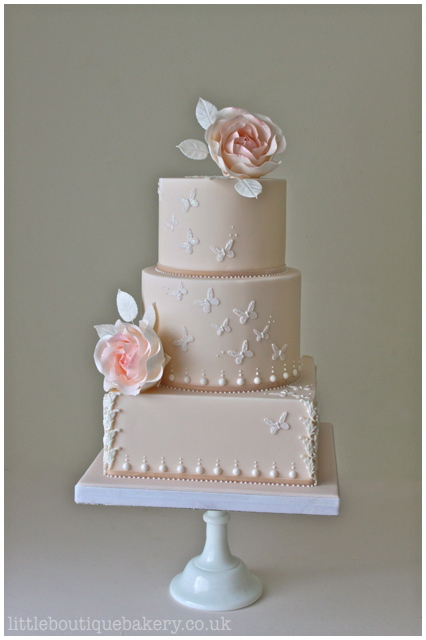 We are based on the East Sussex border in the spa town of Tunbridge Wells and specialise in designing and creating beautiful, bespoke wedding cakes for special events across Sussex and Kent. 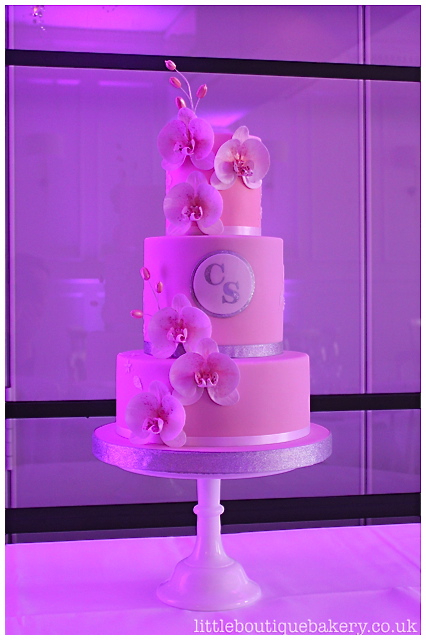 We are professional wedding cake makers who have designed cakes and confections for many events at lovely venues and private residences throughout the south east and London. 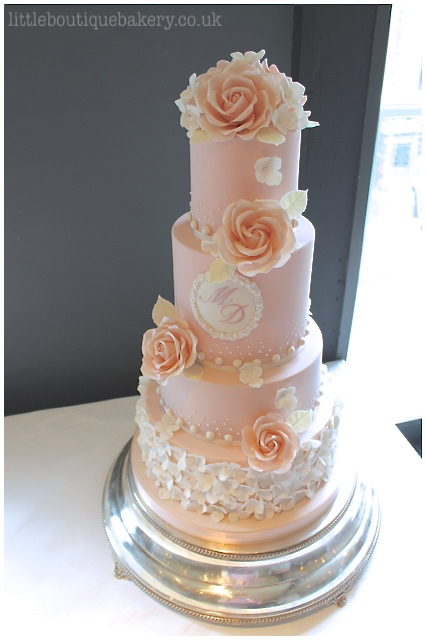 We use ingredients such as pure butter, free range eggs, fine grade flour, 70% cocoa Belgian chocolate and organic fresh fruit in all of our wedding cakes which are made fresh from scratch. 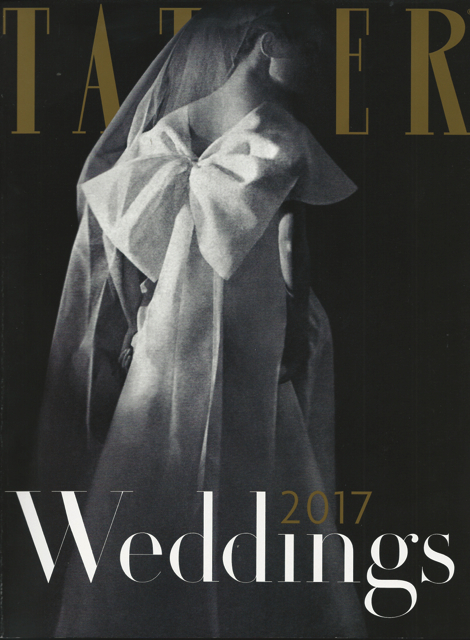 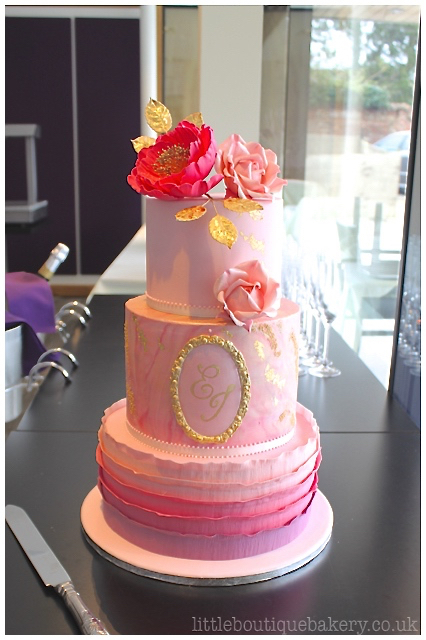 Jennie is a widely published cake artist who creates unique and beautiful wedding cakes with original designs that work perfectly to complement all of your wedding details. 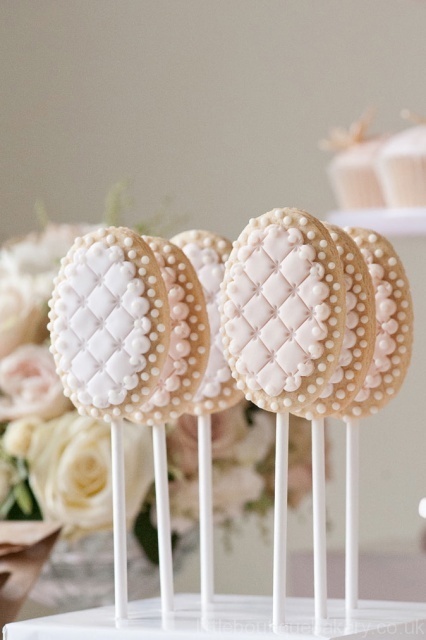 She works closely with you from initial consultation, where you will be presented with some delicious cake samples and discuss all the details of your wedding and ideas, through the design process with detailed hand drawn sketches, to liaison with your venue and set up on the day. 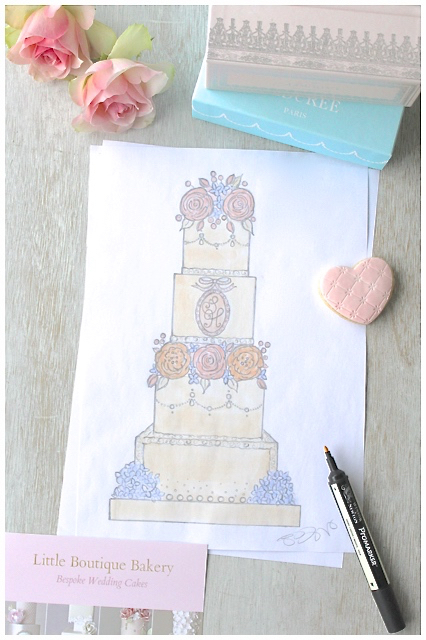 With our professional full bespoke design service, each client receives a personal, detailed, hand drawn sketch of their wedding cake design. 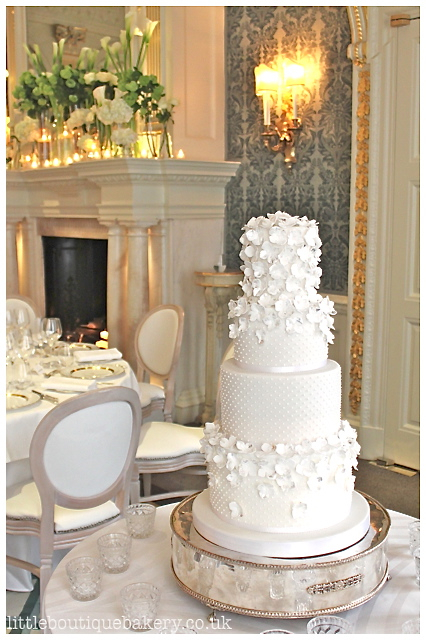 A bridal white wedding cake with hand piped pearls covering the cake and tumbling sugar hydrangea tipped with edible silver leaf set up at Claridges, London. 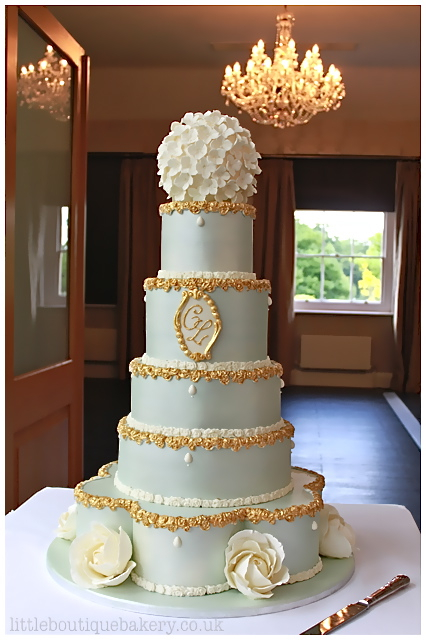 An ornate six tiered wedding cake painted with a bespoke mint lustre and gold mouldings detail with ivory sugar flowers set up at Botley’s Mansion, Surrey. 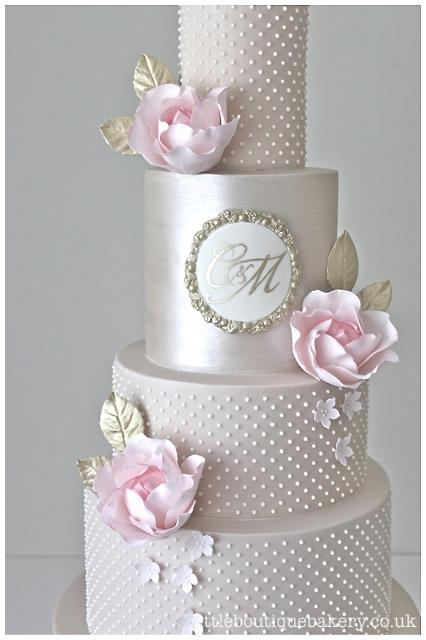 A large four tiered romantic and feminine cake in a soft blush pink and gold lustred tier with monogram plaque, swags of pearls and beautiful sugar roses and hydrangea. 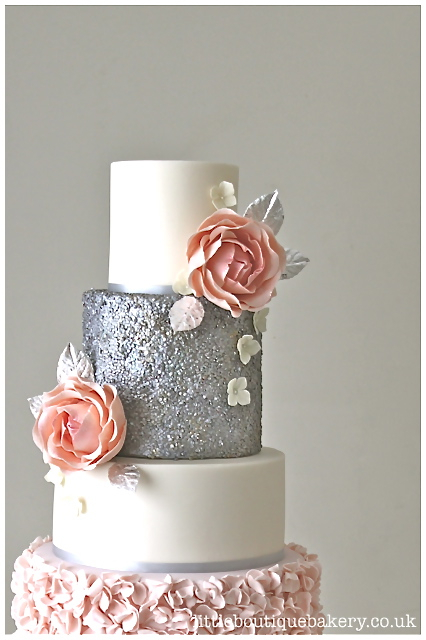 A blush, silver and ivory two tiered top cake with a feature large blush sugar rose with hand piped pearls and edible sequin detail. 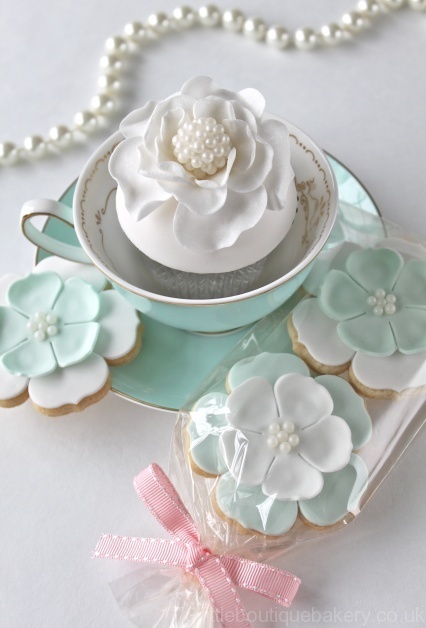 Individual cupcakes with sugar bows, roses and quilting. 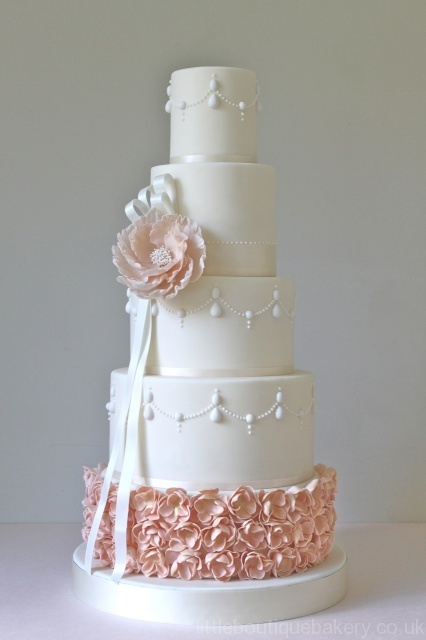 A classic and elegant five tiered wedding cake in ivory with pearl swags and a pretty, textured base of blush sugar petals, featuring a sugar peony corsage with ribbon. 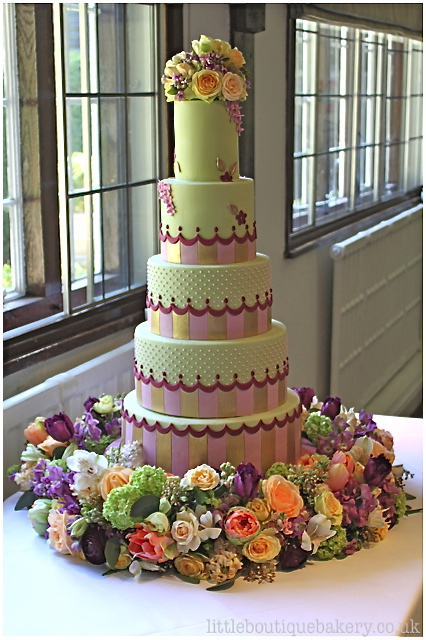 A show stopping five tiered wedding cake we designed with lilac and gold stripes, scalloped plum detail and piped pearls to complement the wedding flower palette which were used to dress the base and top of the cake. 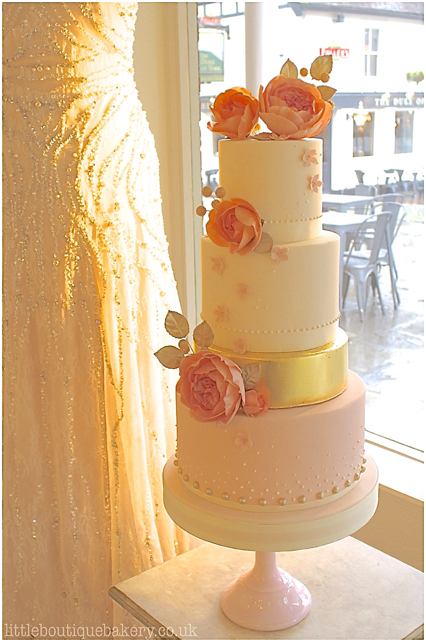 A very pretty and striking wedding cake in ivory and blush pink with an edible gold leaf covered tier featuring sugar garden roses in pinks and peach, pearls detail and sparkling gold berries. 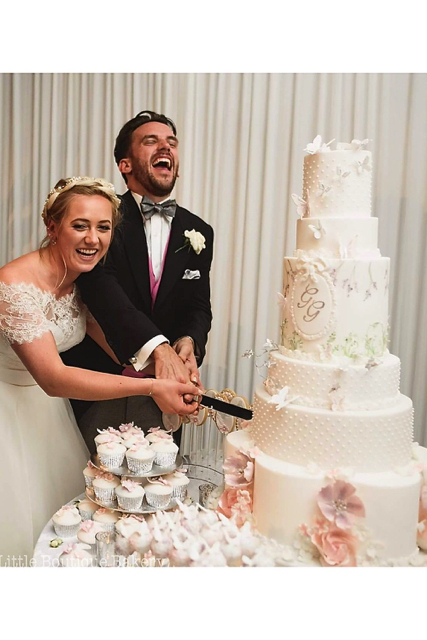 Lovely couple Grace & Guy cut their Little Boutique Bakery wedding cake. 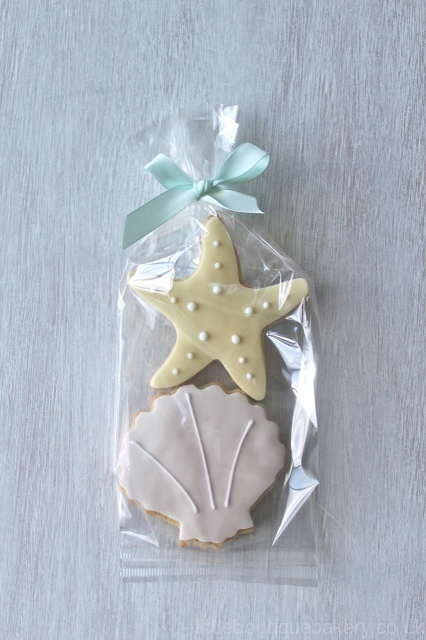 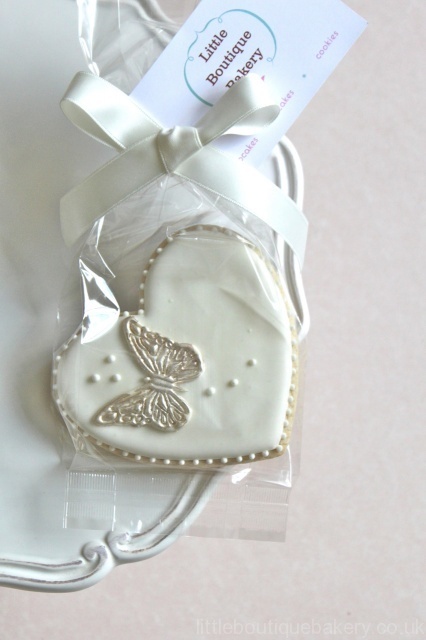 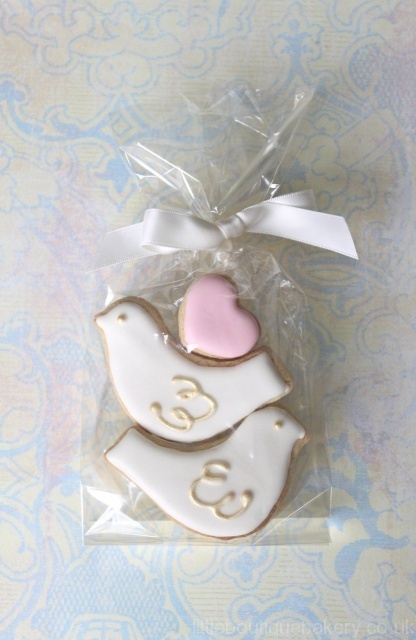 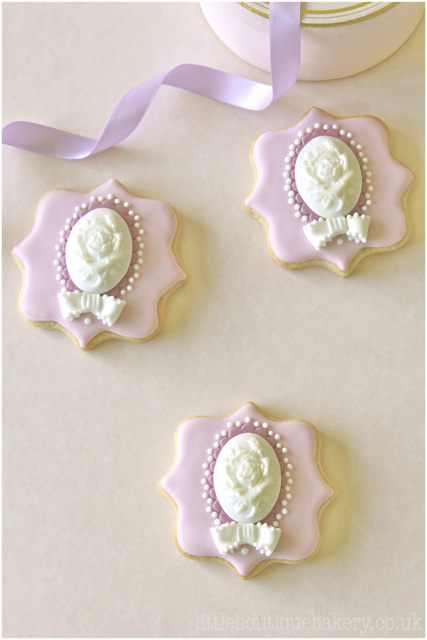 We also make perfectly iced biscuits in bespoke designs which can complement your wedding cake. 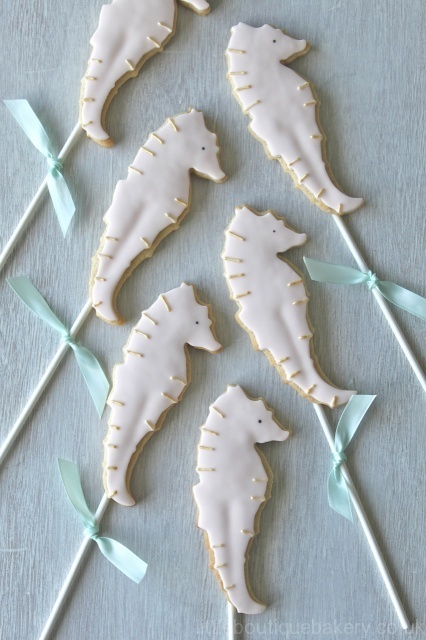 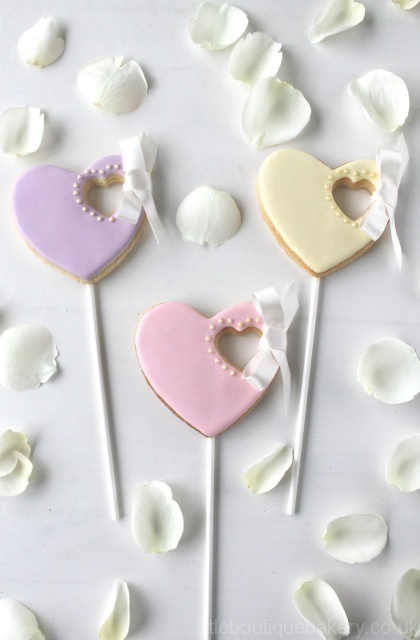 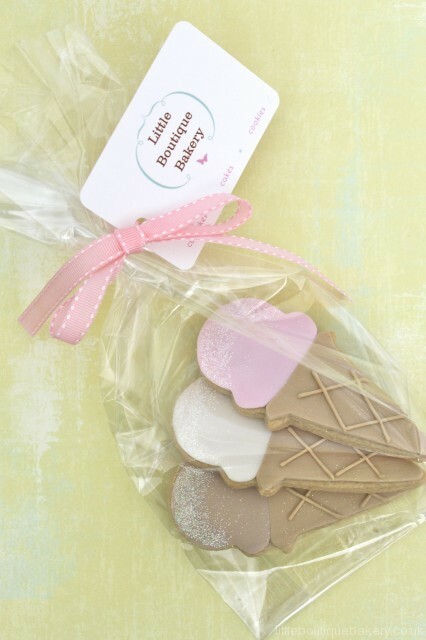 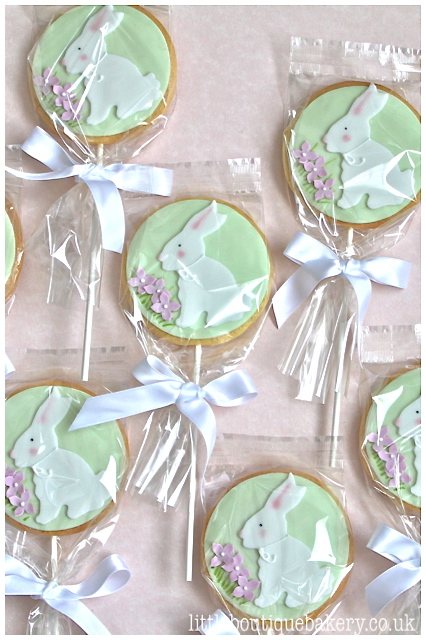 These make perfect wedding favours for your guests or can create a beautiful and unique dessert table display. 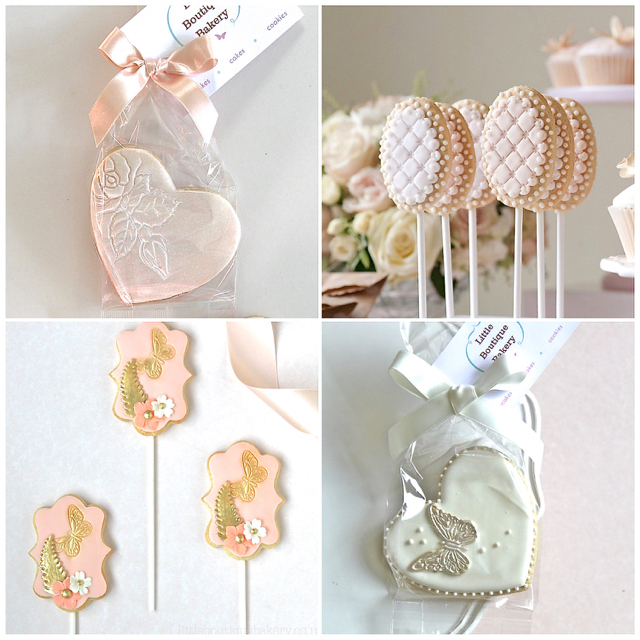 Comments and feed back from some of our lovely clients here. 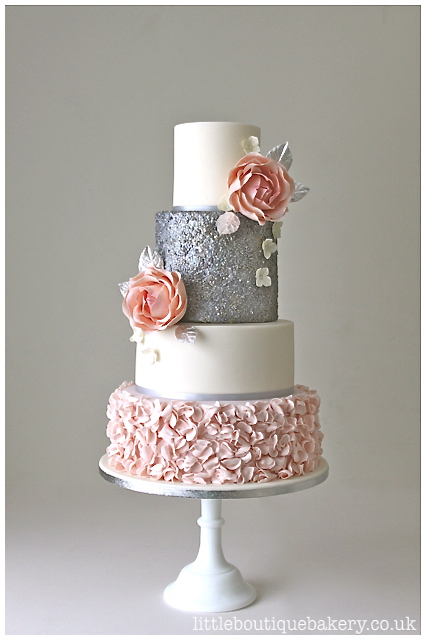 Blush icing and beautiful sugar roses in this bespoke wedding cake design. 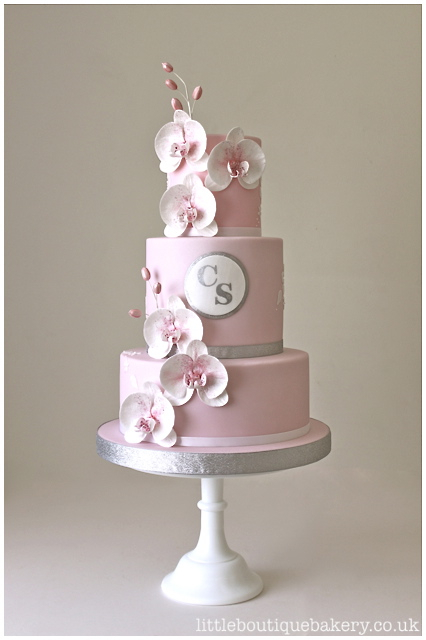 We created this special cake for a lovely wedding at Botley’s Mansion in Surrey. 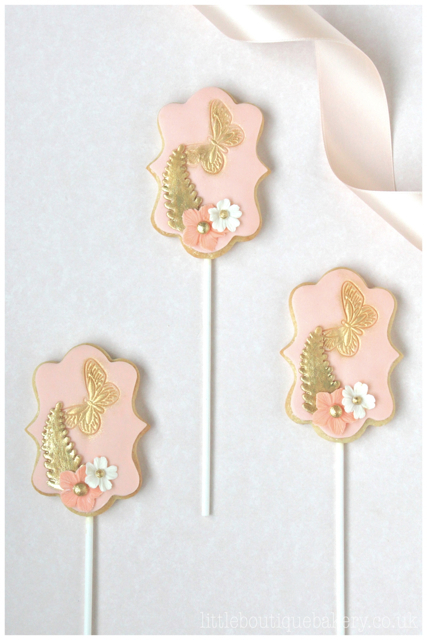 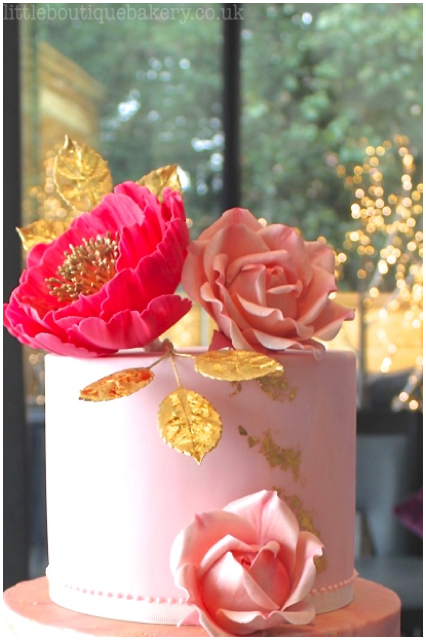 The feminine blush colour of the cake features perfectly piped pearl swags highlighted with a pale gold lustre. 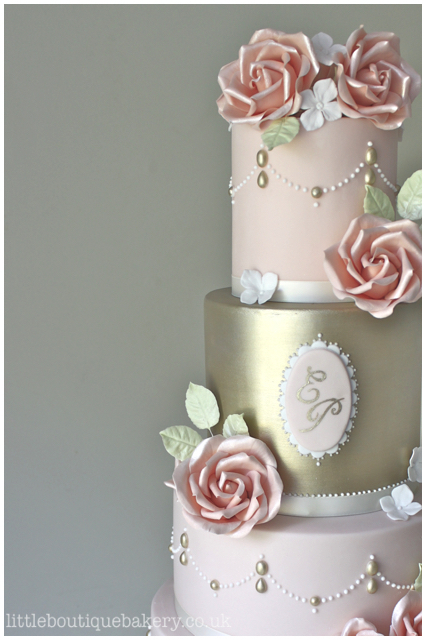 The hand painted gold lustre tier features a personal monogram sugar plaque of the couple’s initials. 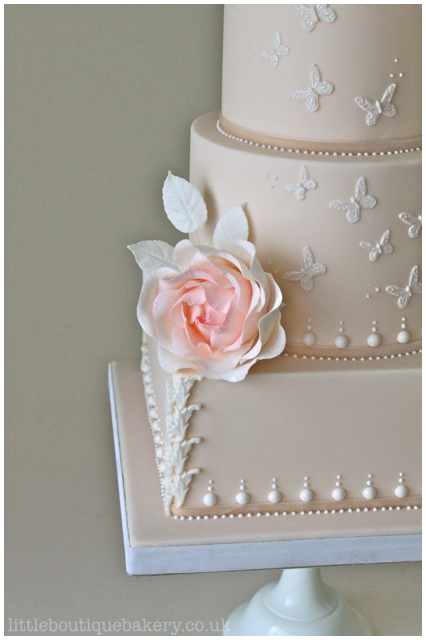 Large sugar roses decorate the wedding cake with delicate sugar hydrangea and leaves. 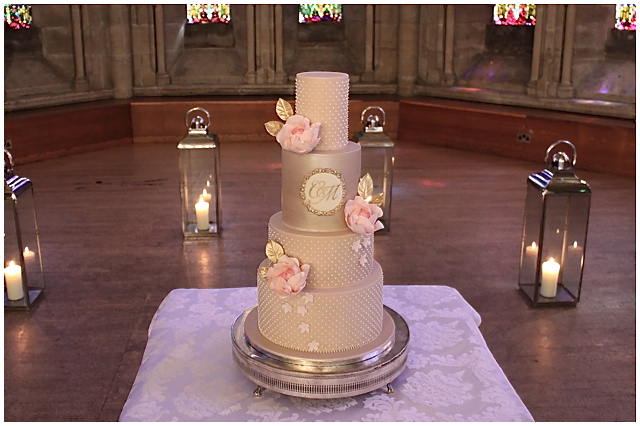 For this summer wedding, our couple chose flavours of Chocolate Truffle, Madagascan Vanilla & Strawberry and Zesty Lemon cake for their wedding guests. 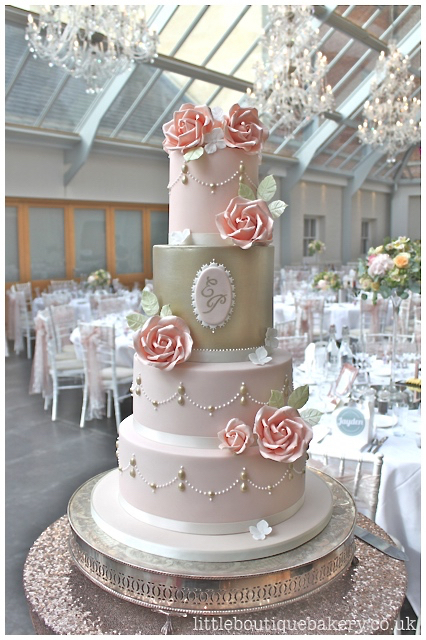 The romantic and classic wedding cake design was perfect for the lovely light filled Atrium at the venue. 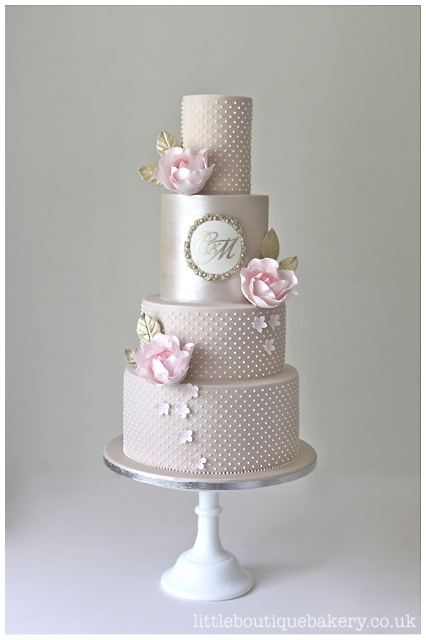 A beautiful five tier bespoke wedding cake we designed for a Surrey wedding with scalloped stripes in gold lustre and lilac featuring real flowers around the base and top. 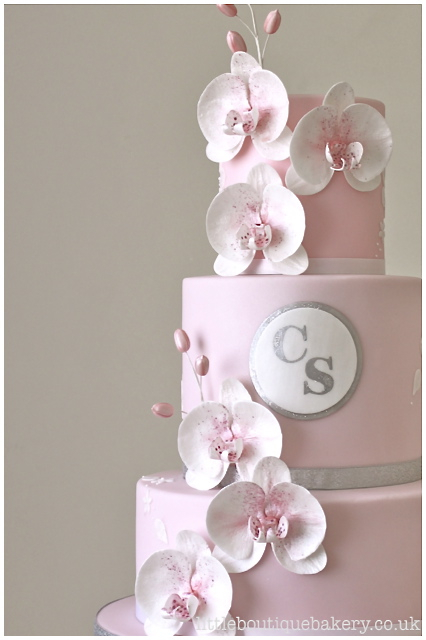 The plum coloured scallops around the wedding cake add a sense of fun to create this show stopper. 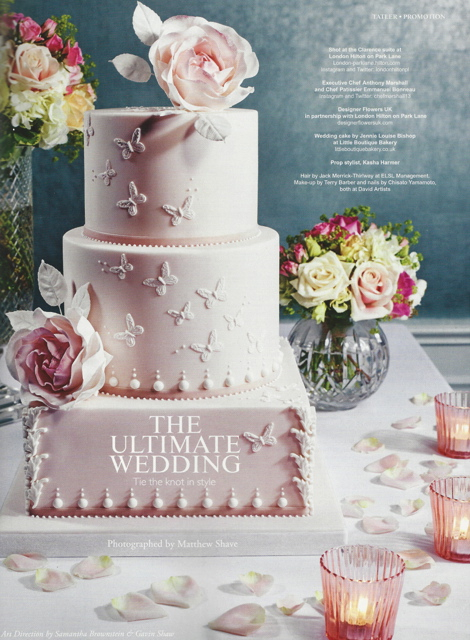 The stunning flower arrangements were created by the lovely bride herself, a florist. 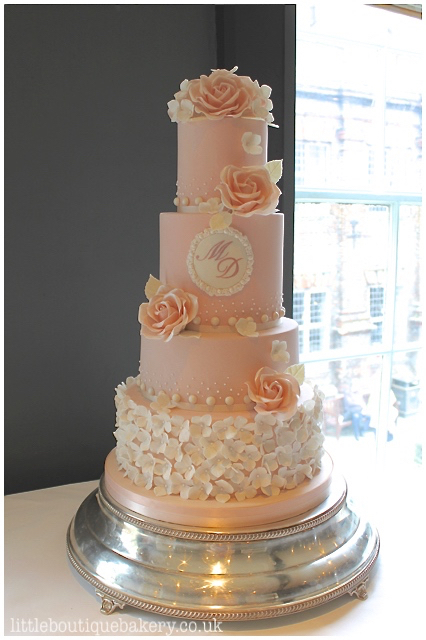 As we look to 2017 weddings and more beautiful wedding cakes, this sequins and ruffles wedding cake design was created for one of our last weddings in 2016. 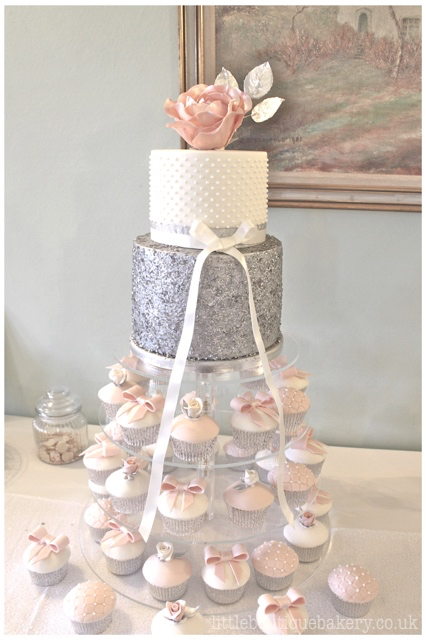 Our couples colour scheme of blush pink and greys were incorporated into this feminine, glamorous design with silver sequin details and blush pink sugar ruffles.